Tapioca( cassava) / Kappa / kolli kizhangu is a starch available in abundance in Kerala. This was a staple food in Kerala and many people had it as boiled, cooked or fried. Tapioca is rich in dietary fiber. It is also a source of calcium,manganese, iron and folate. I must admit that this recipe of tapioca may not be nutritionally beneficial as its deep fried. 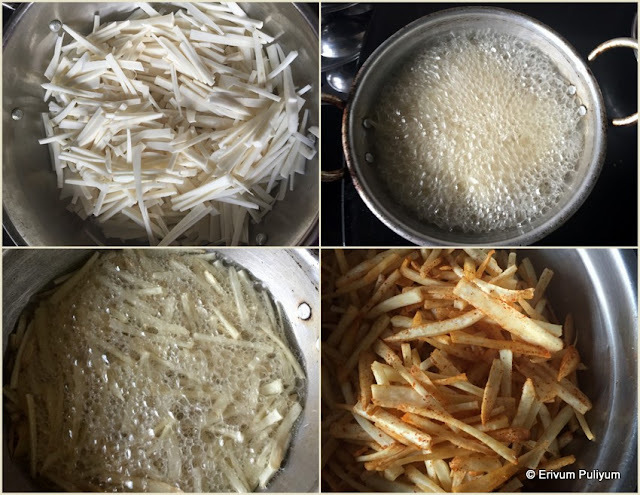 Kids love these fries and we too enjoy when ever its fried at home. Mom told me to try these out as I had a big batch of tapioca at home and had to finish off. Though we enjoyed eating kappa vevichathu(cooked) and kappa puzhungiyathu (boiled tapioca) and at last tried these. These are super crispy,crunchy and delicious, no one can eat just 'ONE',hi hi.. totally addictive. These are quite simple to make unlike the upperi kappa version which I posted sometime back. Only thing to remember in trying out this recipe is that it should be cut and immersed in water. The tapioca should be rinsed well to remove the toxin. Do try it out, am sure you will love it with a cup of black coffee !! Remove the thick brown and pink outer covers of tapioca. Wash under running water and cut each in 3-4 roundels of 4'' length. Then cut it further in thin pieces and further place it on a cutting board and cut in thin strips. Bakery style chips are this kind so made it this way or the easiest way is to use a vegetable slicer or mandolin to cut in roundels. Add the thin strips in water till the time you finish cutting all strips. Drain the water completely and layer on a paper towel. Heat oil in a wok to deep fry at least 2'' deep. When the oil is hot add the thin strips and fry them in batches( don't overcrowd the wok and don't raise the heat on high else the outside turns brown faster and may not get crisp). Then finally once all the chips was fried transfer to a clean dry bowl and add the chilli powder,salt. Give a quick toss,leave to cool completely before storing in air tight containers. * Cutting in strips takes time but I personally feel this is more tastier. You can cut in roundels too. * If you plan to add salt when frying then keep a bowl of water mixed with salt ready to add in between frying. In that case ,when the chips are 3/4 th done,add the salt water right in the middle of the wok and reduce the flame to low or else oil may splatter out and chances of burns are high). You can even cover the wok during this time to avoid splashes. Then drain the chips on paper towel. Yummy and crispy tapioca chips..love this..
addictive snack.. Can I have that bottle! Simple and super yummy. .